I die cut my Summer cut file as an example to share in a quick tutorial video for my Happy Scrappy Place Facebook group (which is also where you can find this cut file for free!) and so I had it sitting in my bucket, just waiting to be used. I've finished up all of my assignments for the next while and so now it's just play time! 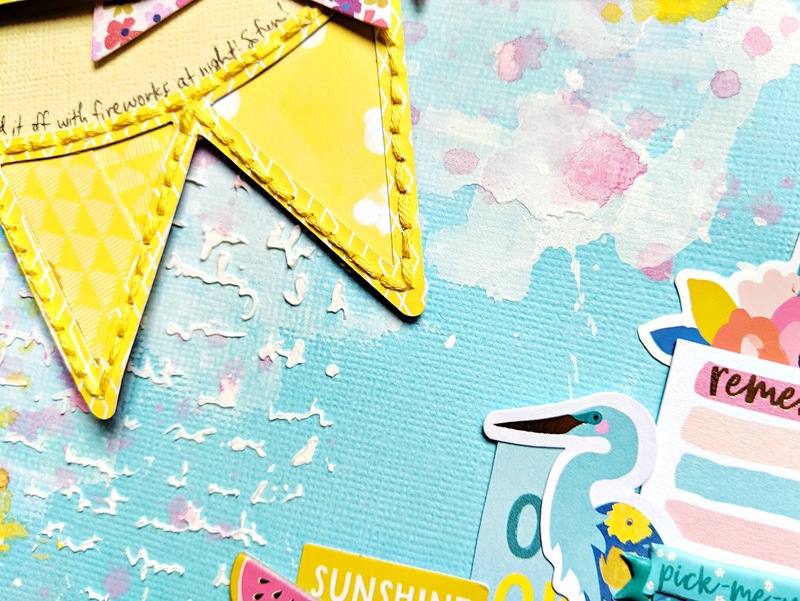 Perfect opportunity to use up things just sitting around, waiting for a rainy day, like this cut file! 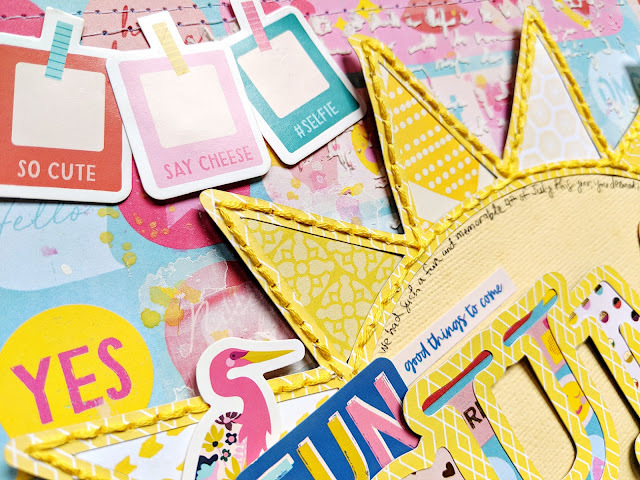 I backed the letters of the cut file with papers from the Pick-Me-Up 6x6 Paper Pad and then used yellow patterned papers from all of my Pink Paislee collections to back the sun rays. I used a piece of yellow textured cardstock to back the circle of the sun after everything else was backed. And then I added hand stitching with yellow floss around the sun. Next came some background work. First I tore three strips of Paper 08 and stitched them to the top of a blue textured cardstock background. Then I used a palette knife to scrap white gesso over the middle. Once that dried I splashed white acrylic paint and pink and blue watercolors on top. And then after that dried I scraped modeling paste through a script stencil. Finished with the background! So then I started layering everything on top. First I placed the cut file on the left side so it covers up a lot of the mixed media, but that's okay, you can still see it peeking through. Then I tucked in the photo under the top right side. 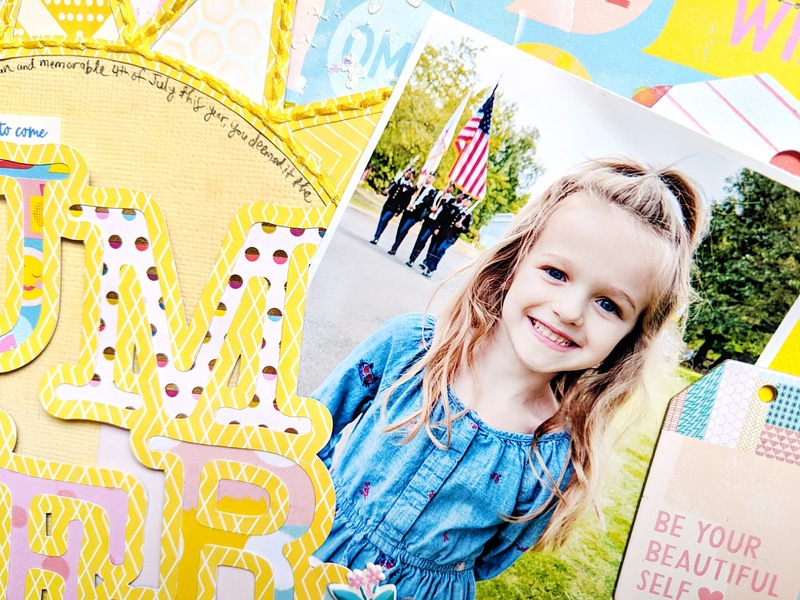 After that I auditioned all kinds of embellishments from Pick-Me-Up that matched the colors and felt summery including Chipboard Stickers, Puffy Stickers, Stickers, Rub-Ons, and Ephemera Die Cuts. I made a few clusters here and there and finished with journaling written around the curve of the sun. Be sure to check out my Happy Scrappy Place Facebook group every week for a free cut file and pair it with my Pick-Me-Up collection!